It's time for beautiful skin. You deserve to look and feel your best, with glowing skin that supports everything you want to do. T L Spa & Wellness offers you an easy facial menu that is designed to give you a truly customized treatment to achieve the best results for your personal skincare goals. You pick a facial and the amount of time, and we partner together to create a customized facial designed to improve the integrity of your skin. See our complete menu below. Have questions about any of our treatments? Please contact us! This facial is designed for complete relaxation and rejuvenation that will leave your skin renewed and glowing. Includes a deep cleansing, enzyme exfoliation, extractions, nourishing mask, pampering face, neck and shoulder massage, serum, moisturizer and paraffin hand treatment. Our Elevate facials are customized and personalized to meet your specific skin care needs and desired results. 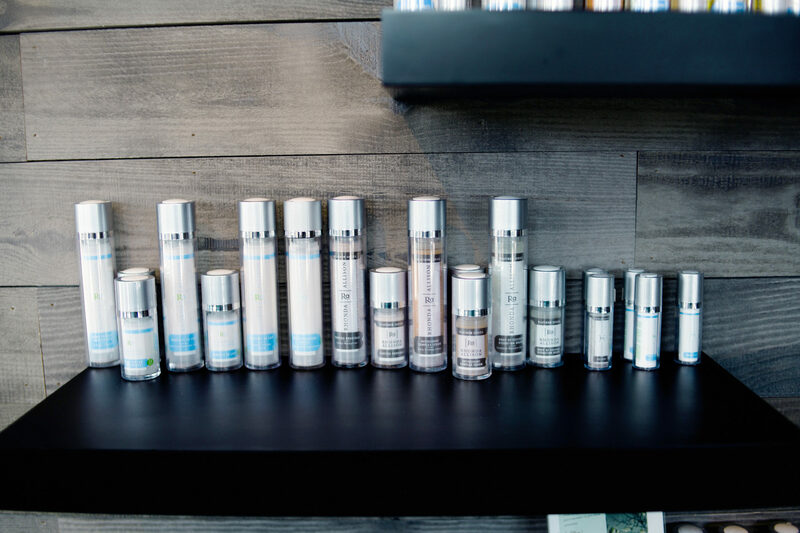 We use a variety of advanced modalities, techniques and professional products that are designed to help your skin achieve its optimal health and appearance. All advanced facials include a deep cleanse, enzymatic exfoliation, extractions, neck and shoulder massage, customized nourishing mask, serums, and modality(s) based on length of time. More time allows for more modalities and quicker results. Modalities Include: Microcurrent, Hydra Skin Refiner, RevitaPen, Vitamin A Infusion (non acid peel), Celluma LED light therapy, Facial Contouring Massage. Read the benefits of each modality below. 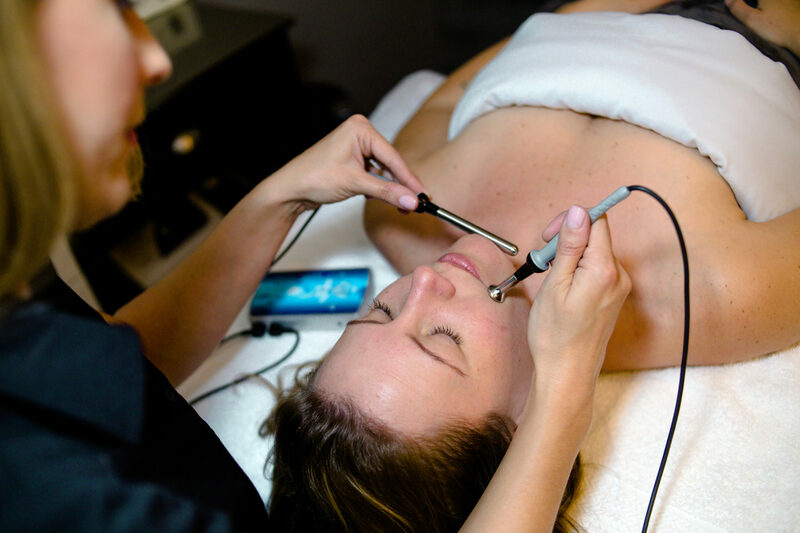 Microcurrent is a sub-sensory current that lifts and tightens your face by re-educating the facial muscles. The result is visibly lifted muscle tone and softening of fine lines and wrinkles. As a one time treatment, it will give you that lift and glow for any special occasion and will last for days. Results are cumulative, a series is recommended for best results. The Hydra Skin Refiner is an advanced skin care technology using the power of water and vacuum suction. This 5 step treatment cleanses, exfoliates, extracts dirt and debris from the pores, infuses the skin with serums and peptides and finishes with oxygen infusion. Your skin is left clean, exfoliated, plumped, hydrated and glowing. This is a noninvasive device designed to create instant visible results. RevitaPen painlessly creates hundreds of thousands of superficial micro-channels on the surface of the skin allowing nutrients to be driven into the deeper layers of the skin. Your skin is left rejuvenated while softening fine lines and wrinkles, improving skin texture, diminishing scar tissue, and increasing hydration and circulation. The Facial Infusion is a revolutionary non-acid peel delivering long term skin benefits using the most potent form of vitamin A to gently resurface the skin. This unique formulation increases circulation, delivers nutrients deep into the skin, boosts immunity and stimulates collagen production. Your skin will be immediately transformed! LED light therapy is a painless, relaxing, non-invasive skin care treatment designed to activate and promote collagen and elastin production, as well as increase the rate of skin cell renewal. LED is great for reducing fine lines, wrinkles and treating mild to moderate acne. Facial contouring massage is a non-invasive facial technique that releases fascia to enhance skin health. Done with or without Microcurrent, it lifts and contours the face muscles with massage, lymphatic drainage, and fascia release. Benefits include increased circulation, decreased puffiness and inflammation, improved texture and skin tone, and, over time, skin that’s firmer and smoother, with minimized fine lines and wrinkles. Ready for an amazing facial?